The camera was pointed at right angles across a busy park pathway. On the other side of the path are many trees receding into the distance. About one third of the composition is taken up by sky. Many people move through the picture, both on and off the pathway. One frame was taken each time a person on the pathway moved into the picture and one frame was taken again as they moved out. The procedure was repeated over a period of three days with filming beginning at dawn and ending at dusk. Two of the days were sunny and the other was very stormy. 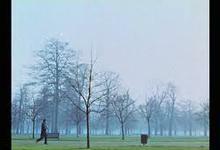 The speed at which people, clouds and shadows move in the film is directly related to the flow of people through the park.